"It is absurd and illusory to imagine that we can view the past from any vantage point but the present, or to pretend that we can project ourselves back to the minds and bodies of participants in past events. All we can do is endeavour to be honest about our position in the present, and about the way our vision of the past relates to our vision for the future." Tessa Morris-Suzuki - Towards a Political Economy of Historical Truthfulness. Morris-Suzuki writes beautifully about representations of the past in photographs, film, cartoons, textbooks and museums, and why they are important for our understanding of history, and why we should strive for historical truthfulness instead for historical truth. "Historical truthfulness refers to the way we conduct our relationship with the past. It begins with attentiveness to the presence of the past: the recognition that we ourselves are shaped by the past, and that knowing the past therefore is essential to knowing ourselves and others, and indeed to knowing what it is to be human. (...) Historical truthfulness is an ongoing conversation through which, by engaging with the views of others in different social and spatial locations (across and within national boundaries) we shape and reshape our understanding of the past." Tessa Morris-Suzuki - Towards a Political Economy of Historical Truthfulness. Museums have a long history of being structured after strong linear narratives, with little room for contradicting worldviews. This way of displaying history, and museums tendency to mis- and underrepresentation of minorities, have the last three decades been strongly criticized. Historical truthfulness is therefore taken seriously by museums today, to make the museum a space for different versions of the past, and a space for discussions about the past. However, Morris-Suzuki also emphaize, that to use media texts like photographs, film, cartoons etc to build up our understanding of the past, we need to be aware of how media texts are used, reused, edited and recontextualized. Media texts, which already have had a life outside the museum, are more and more common in exhibitions. Both as museum objects, photographs are for example displayed beside an old dress in a vitrine, and as part of media installations. A media installation can for example be a touch screen where you can look at digitized photographs, drawings or documents, or a combination of film and sound recordings that have not been combined outside the museum. From my analyses of media installations at the Churchill Museum and the Museum of London, I have noticed that these two museums do not reveal much information about where the digitized media texts (photographs, film and sound recordings, documents etc.) come from, or in which context they originally were used. 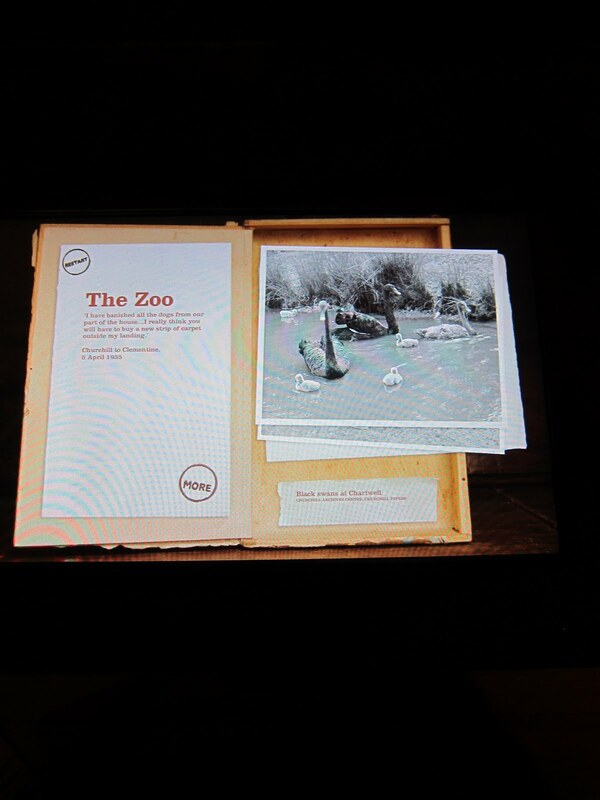 The media texts that are displayed as objects in vitrines tend all to have labels. 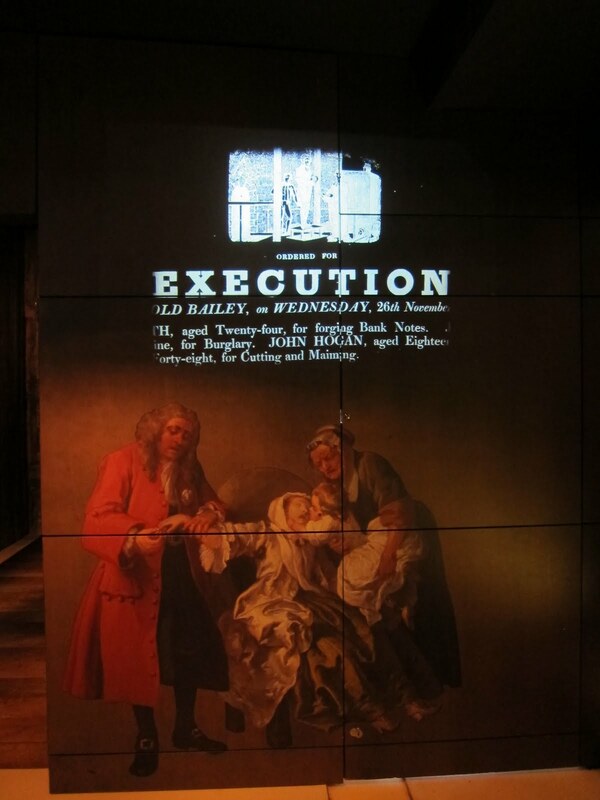 (This was especially apparent in Museum of London.) This shows that there is a different understanding of the role of media texts when they are displayed as objects and when they are part of an installation. The problem, as I see it, is that the installations often include fictional elements, it is therefore difficult to see which parts of the installation are created for the exhibition, and which did actually exist at the time the installation is trying to tell something about. Another problem is that media text are not neutral descriptions of the past, and it is both important, and just interesting, to know who made them, why they were made and how they were used. An installation that is a combination of extracts of digitized old newspapers projected on a wall above a copy of a painting. There is no information about neither the newspapers or the painting. The quotes from Tessa Morris-Suzuki are from the text you can find here, a speech based on her book The Past Within Us (2005).